Marketing Hub Enterprise users can assign content to teams and additional users. This keeps content dashboards streamlined, so each user only sees relevant content in their account. All new content is unassigned and visible to all users by default. Only Admins can assign content to teams in their account. After content has been assigned to a team, members of that team can assign content access for that asset to child teams of their own team. Please note: admins with permission to partition by teams can assign any piece of content to any team. In your HubSpot account, navigate to your landing pages, website pages, or blog dashboard. To assign one page or post, hover over the content you want to assign, then click the More dropdown menu and select Assign users & teams. To assign multiple pages in bulk, select the checkboxes next to the pages you want to assign, then click Assign users & teams. In the dialog box, select the checkbox next to the team name or contact name. 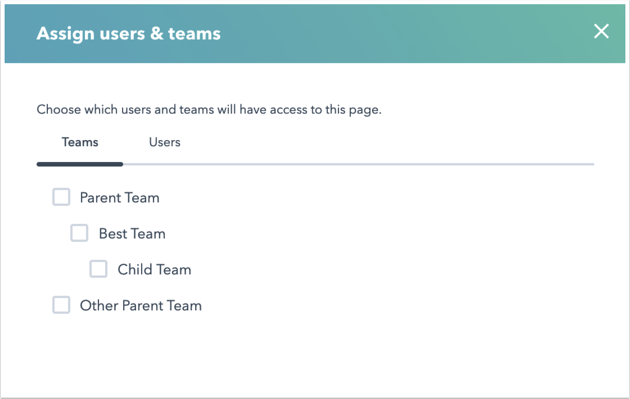 If you're using hierarchical teams and assign content to a child team, the parent team gains access automatically. To assign the content to additional users, click the Users tab. User can only be selected if the content is assigned to at least one team. Please note: any new or bulk changes from the content dashboard will override existing team assignments for the selected page(s). Users with Admin access will still be able to access all content across all tools. Admins can filter their content dashboard by team using the All teams dropdown menu. Please note: this feature controls what content users see in their content dashboard. To control the subdomains teams can use to publish content, learn more about domain publishing permissions.